Customize your Studio Search Page. 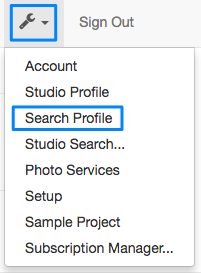 Your Studio Search Page can be customized to fit your brand and customer needs by adjusting the parameters listed below from Wrench menu > Search Profile. Each Project also has a single search page that can be used instead of (or in addition to) your main Search Page. Display "Project Search" box enables customers to search for a Project by name or any Subject by code. Confine project search box to codes only. How projects are ordered in the search display. This is the number of projects displayed. Use 0 to disable or 10000 to display all. The Project search instructions displayed in the search bar. The Subject search instructions displayed in the search bar. The thumbnail search instructions displayed in the search bar. The Project search button text. The Subject search button text. The message displayed for an empty query. The message for Project query results. Use #QUERY to embed query in your message. This is the message when a project query returns no results. Use #QUERY to embed query in your message. The message for Subject query results. Use #QUERY to embed query and #PROJECT to embed project name in your message. The message when a subject query returns no results. Use #QUERY to embed query and #PROJECT to embed project name in your message. This is the message for subject not ready. Use #QUERY to embed query and #PROJECT to embed project name in your message. This is the message template for studio contact. Use #PHONE to embed phone number and #EMAIL to embed email address in your message. This is the message for code not found. Use #QUERY to embed query in your message. This is the message for remote server problems. Use #QUERY to embed query in your message. This is the background color for the studio's search page. Click for hex color codes. The foreground color for your Studio Search Page. The link color for your Studio Search Page. The link color for the info section of your Studio Search Page. The background color for the info section of your Studio Search Page. The foreground color for the success section of your Studio Search Page. 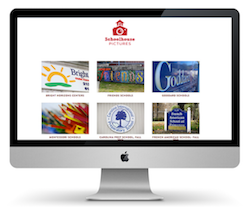 The background color for the success section of your Studio Search Page. The foreground color for the fail section of your Studio Search Page. The background color for the fail section of your Studio Search Page. The additional message or instructions for the Studio Search Page. This field is free-form.